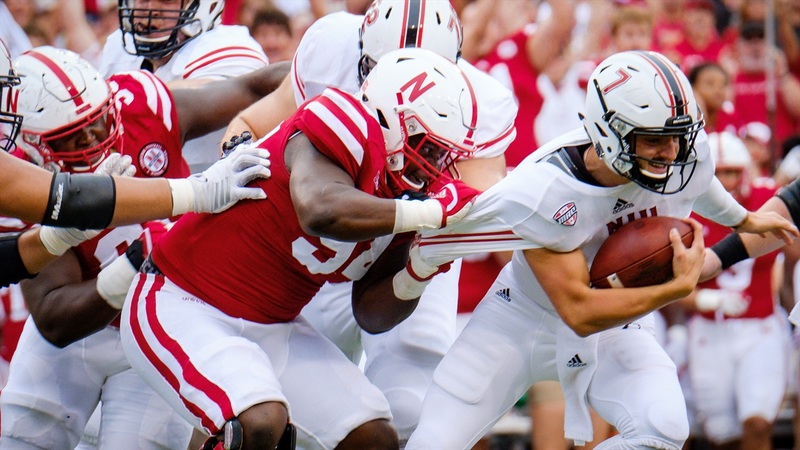 We are still in the early stages of the Bob Diaco era, and as such Nebraska's defensive coordinator is still learning about his team and what each of his players is capable of doing. That learning process goes for us as media members as well, and to get a better feel for how Diaco is using his personnel I decided to watch the tape from last week's loss to Northern Illinois with an eye specifically on formations and personnel. I charted which defensive player was on the field and what position those players were at on all 54 of Nebraska's snaps. The results were interesting enough that I felt like sharing them. The first number that stands out is that 54 next to Carlos Davis' name. He was on the field for every snap last Saturday, which is impressive for a man of his size and age. They moved him around at a couple different spots, giving him a chance to make plays. On 32 of his 33 snaps as a defenisve end in the base 3-4, he was on the boundary side with the other coming on the field side. He played three snaps at the nose in passing situations and also played 18 snaps as a boundary defensive tackle when Nebraska chose to play a four-man front, which meant the boundary outside linebacker lined up next to Davis with his hand in the dirt. Carlos' twin Khalil got a solid number of snaps off the bench and was really productive, and Nebraska plugged him in at a couple different spots. Khalil Davis spent eight snaps as a field defensive end in a four-man front, six on the same side in a three-man front, three as an end on the boundary side and three as a tackle on the boundary side in a four-man front. Nebraska played 35 snaps in the three-man front and has a solid rotation with Stoltenberg and Thomas, with Carlos Davis playing at that spot situationally. Thomas was on the field most often on passing downs as he is more of a pocket-pusher compared to Stoltenberg's run-stopper. Luke Gifford may still be listed as a second-stringer, but even so he has become Nebraska's most indespensible linebacker. He's also listed as a field – or Dog – linebacker, but he is playing the vast majority of his snaps at the boundary – or Cat – spot while Marcus Newby and Tyrin Ferguson held down the Dog spot. Gifford played 32 snaps at Cat compared to six at Dog (with four, three and two linebacker lineups). He also played 11 snaps with his hand in the dirt as a boundary defensive end. Nebraska has a a solid rotation at inside linebacker with a pretty even split between Chris Weber and Dedrick Young. Weber played most of his snaps on the field side while Young spent most of his on the boundary side. Mohamed Barry came off the bench to spell both of them and played a decent number of snaps, although all of his either came at the boundary inside spot or the boundary outside spot when Nebraska was in a 4-3 look. Newby's snap total would be higher but he got hurt midway through the third quarter, opening up the opportunity for more snaps by Ferguson. The problem here is that those two plus Gifford are the only three players who have logged snaps at the Dog spot, and Newby and Ferguson are both out for the Rutgers game. Alex Davis is listed as the first string Cat 'backer with King as his back-up, but in this game Davis got all seven of his snaps (yeah, he was only on the field for seven defensive plays) with his hand in the dirt as a defensive end. King got nine snaps (although four of them came on the final Northern Illinois drive that included three kneel-downs) with just two of them coming as a stand-up outside linebacker (one of which did not go well). Does Gifford play Cat full time with Newby and Ferguson out? If so, does Nebraska give Davis and/or King another shot to play as a real linebacker? Or do they look to the bench at some of the younger guys waiting in the wings who have yet to see the field? Miller, a redshirt freshman, is an interesting player to consider as he was named scout team defensive MVP during his redshirt year. Nebraska seems to be yanking him all over the place though as he came in as a defensive end, was moved to inside linebacker in the 4-3, then moved to outside linebacker, then moved back inside and now is working outside again. If there's one spot to watch on Saturday, it's the outside linebacker spot across from Gifford. Nebraska has played six defensive backs in each of their games so far I believe, and that was the case in this one as well. Aaron Williams was he only player other than Carlos Davis who played every snap in the game, although Antonio Reed was close as well as he started in place of Joshua Kalu and did so with a cast over his thumb (which certainly affected his tackling ability on a handful of plays). Marquel Dismuke came in as the third safety in dime situations and then took Reed's place for the three snaps that the junior missed. Lamar Jackson played all 47 of his snaps at field corner, while Eric Lee Jr. played 36 snaps at boundary corner and six as the slot corner in the nickel and dime packages. Dicaprio Bootle came off the bench to spell both of them and to play with them in nickel and dime. Out of 54 snaps, Nebraska played nickel just four times and dime just two. The other 48 snaps were more or less base personnel (32 with a three-man front and 16 with a four-man front). One solution to Nebraska's linebacker problem is to play more nickel with a corner in place of one of the linebackers, but Diaco has shown a hesitancy to do so, choosing instead to leave his linebackers on the field and having them drop into coverage. Playing more 4-3 with Davis or King at defensive end rather than linebacker is another possible solution. It will be interesting to see how the snaps play out against Rutgers. With the injuries piling up, it's time for Diaco to get creative and earn his money.